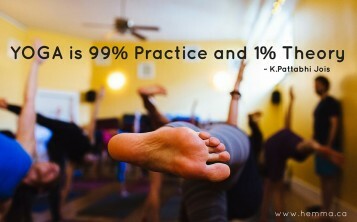 You’ve heard the phrase “practice makes perfect”, but what is this perfection we seek? With many trades, sports, careers, and arts, practice is the key to developing skills and excelling towards mastery, or what many perceive as perfection. Yoga practice is different because there is no end goal, it’s simply about the practice; about showing up for yourself and diving in. As with anything you dedicate your time to, you will likely notice improvement or ease in the experience – more flexibility, more strength, more peace. These benefits are positive side effects of Yoga, but not necessarily the goal. As we gear up for 30 Days of Practice at Hemma, I’ve been reflecting on why I devote time to practicing something that is focused on experiencing rather than achieving; on being rather than becoming. For me, practicing Yoga (and all of it’s branches) is about cultivating presence in mind, body, breath, heart, and actions. What I tune into isn’t always peaceful and blissful, but it’s real. This practice of presence supports me to understand myself and how to serve others. I keep coming back to the term Sadhana, which is a Sanksrit term for “daily practices for transformation.” There are many translations of this term, but I keep this one close to my heart as it inspires me to keep going. Doing a little bit of Yoga every day is usually more transformative than a lot of Yoga once a month. As we develop this daily rhythm, we cultivate sensitivity to our changing needs and adapt our practice depending on our energy level, time of day, or season. It’s what we do daily that makes us who we are. Join us for the 30 Days of Practice Opening Circle on February 25th at 8pm. Let’s support one another on this journey!